Toxic smog shrouded the Indian capital on Thursday after people set off a multitude of firecrackers to celebrate the major Hindu festival. 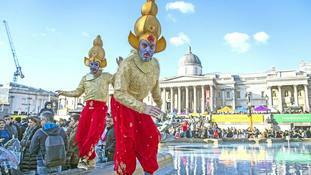 Hindus, Sikhs and Jains have staged a colourful celebration in central London. David Cameron visited one of the biggest Hindu temples outside India today, Shri Swaminarayan Mandir in Neasden, north-west London, to celebrate the Hindu festival Diwali. In a speech to thousands of worshippers, the Prime Minister said that the values of the UK's Indian community should be "ever more involved" in shaping British life. He also told worshippers he will soon make his third official visit to India as Prime Minister and said the British Indian community could help build relations with the Asian country. Click here to read more news on David Cameron. Thousands of Hindus, Sikhs and Jains around the world today are celebrating the first day of Diwali. Last night worshippers lit earthen lamps, decorated home and streets with colourful lights and burst fire crackers to mark the eve of the celebration. Diwali - known as the festival of lights - is celebrated for five days.